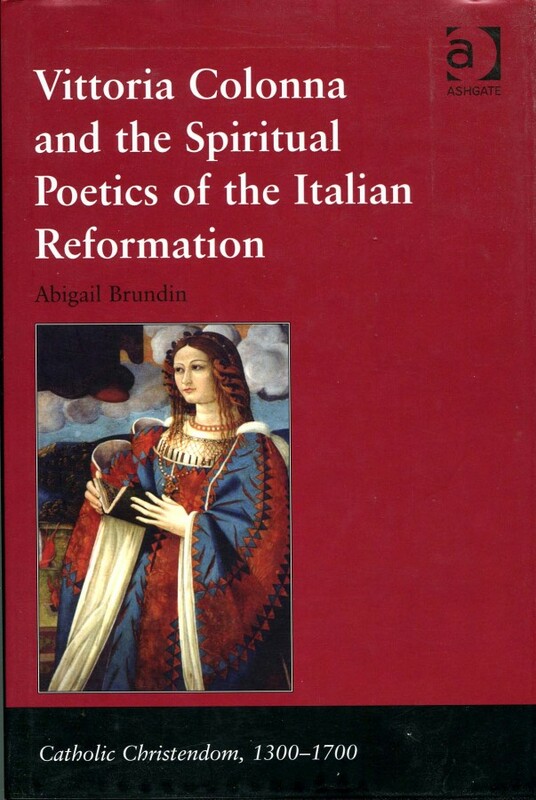 From "Vittoria Colonna: A female genius of Italian Renaissance," by Maria Musiol. 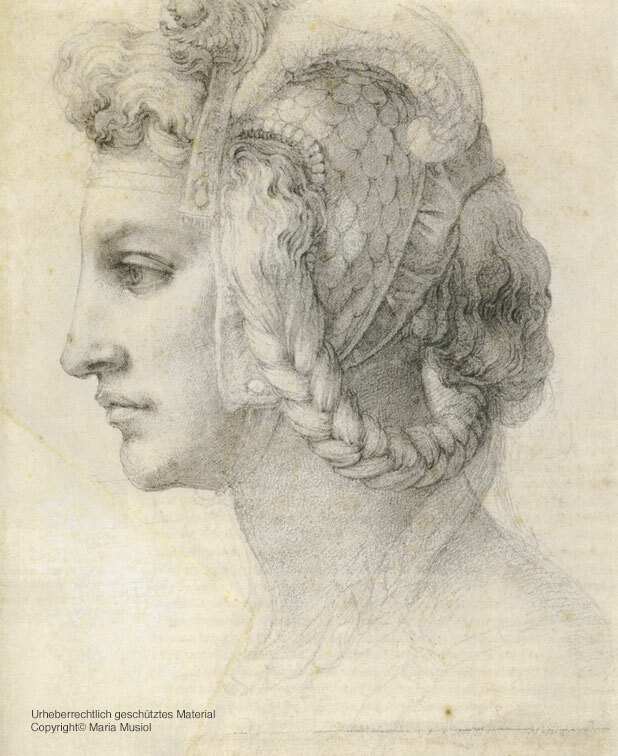 As Michelangelo loved Vittoria Colonna - she was the only woman in his life: “grandemente amò la marchesana de Pescara” (Condivi) - , he did neither paint a rigid portrait of her nor did he aim at an ideal image in his drawings. Intent on visualising her inner liveliness, he was also so much fascinated by her androgynous appearance that he wanted to transfigure his whole body into one single eye to rejoice in her delightful sight to the fullest. 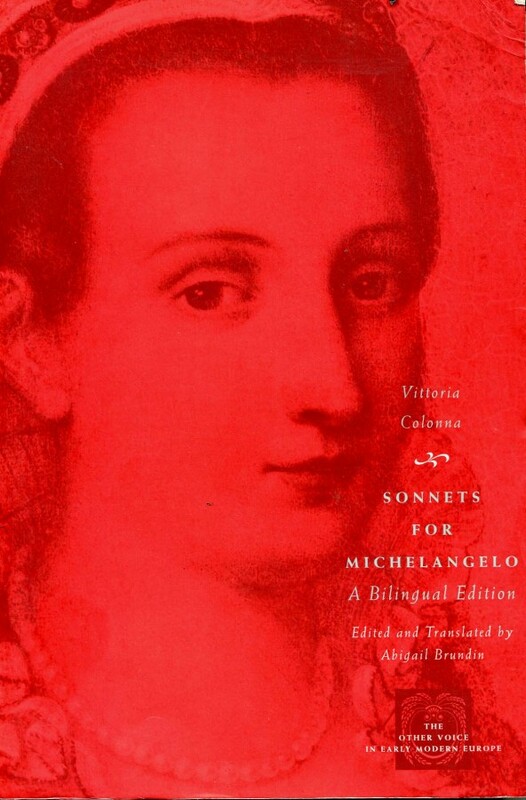 Scarce is the evidence about the relationship between Vittoria Colonna and Michelangelo. One letter by Michelangelo and two letters by Vittoria Colonna deal with a drawing of the crucified created by Michelangelo to do her a favour. Of numerous poems he dedicated to her, only one poem can be ascribed to her for certain, because he had scribbled it on the backside of a letter to his beloved Marchesa. In another letter, again without a date, enamoured Michelangelo, already in his sixties, is searching an occasion to pay her a visit. Vittoria gave him a politely disguised brush-off in her letter of July 20th (1542?) she sent him from Viterbo. On the other hand, she often travelled from there to Rome in order to visit her “singolarissimo amico”. They exchanged sonnets and he drew a Pietà for her and a Samaritan woman at the well. “Unique Maestro and my most singular friend”, Vittoria addressed him in a letter. The first superlative unique is even surpassed by the second: “My most singular friend”. 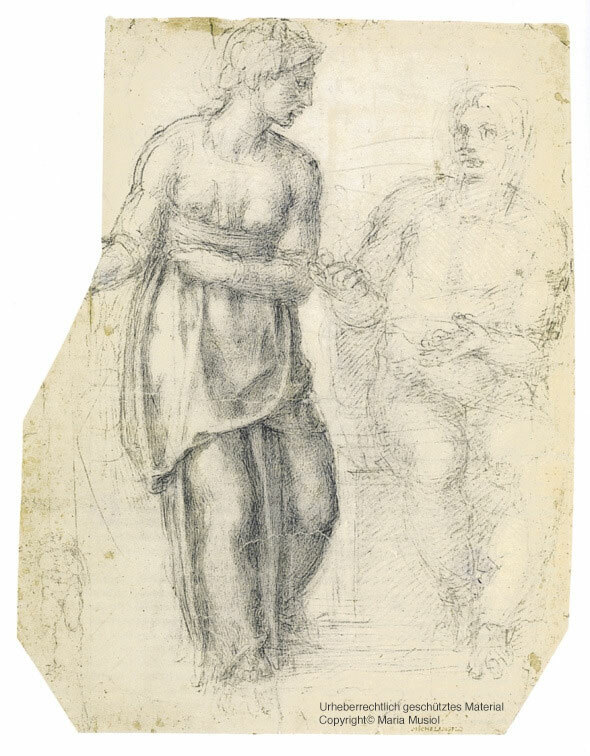 Only by means of a synopsis of their letters, their poems, of the drawings Michelangelo created of Vittoria and for her, the relationship between these two geniuses can be revealed in greater complexity. One cannot help surmising Vittoria had a deeper significance for Michelangelo than being his muse or Platonic mistress. 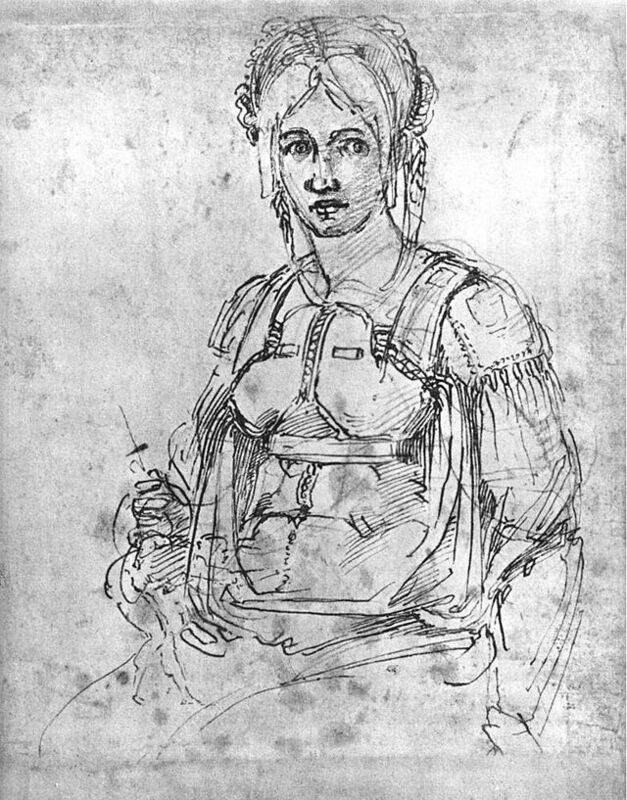 Michelangelo created six drawings of her. The identity of Vittoria could be ascertained thanksto references to her physiognomy in written primary sources. 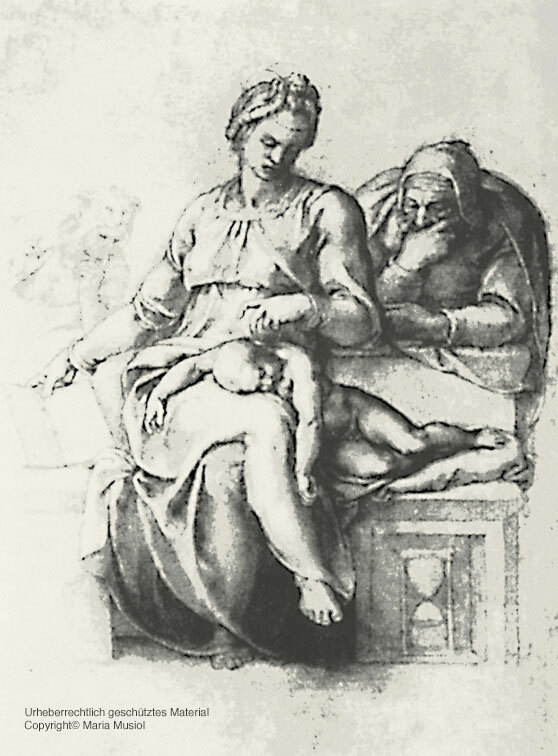 Michelangelo did not portray Vittoria. He created intimate drawings of her to visualise her emotional liveliness that mesmerised him. In secondary literature these drawings were vaguely called “Ideal head of a woman”, “a woman”, “the head of a young man.” Vittoria has not been identified so far, although there had been some guesses as to her identity. But there was no proof. 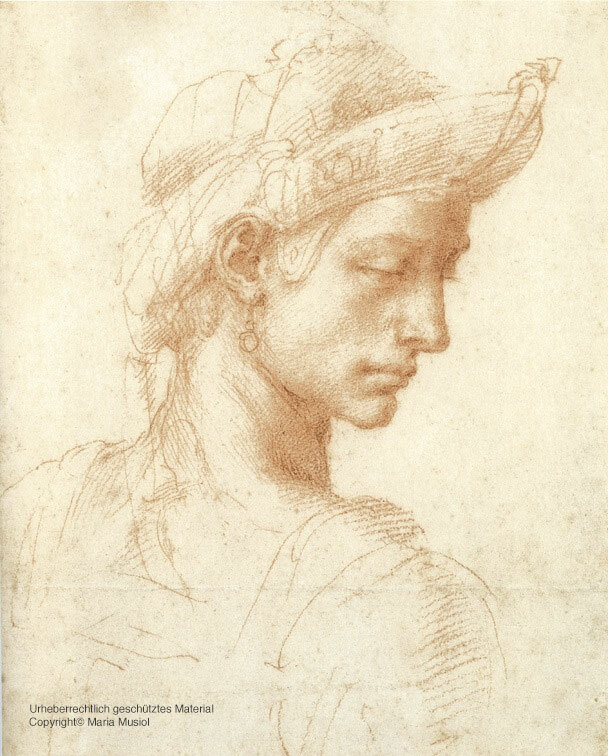 Michelangelo did not idealise Vittoria in his drawings. Fascinated by her androgynous features – “a slightly masculine décor” (Giovio) –, he wished he could transfigure his body into one single eye to rejoice in her visual appearance to the fullest. 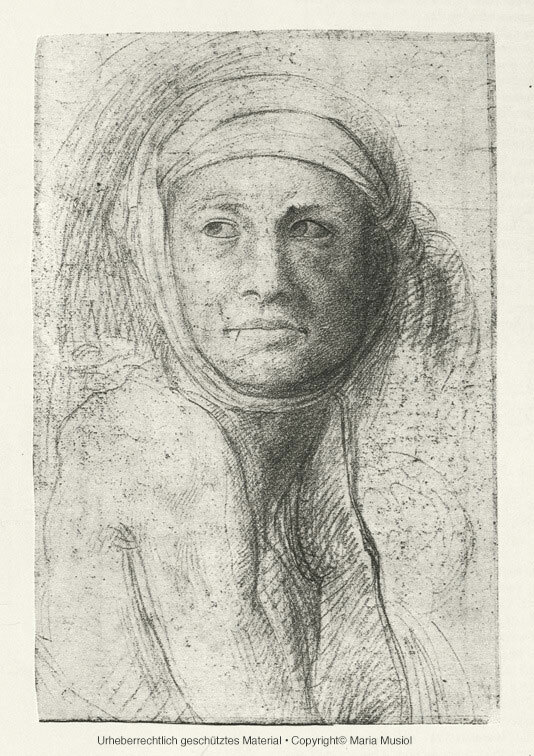 Her distinctive features (long nose, full lips, rich hair, pretty ears, ear rings, anorexic meagreness) are rendered precisely by the artist and are confirmed by contemporary evidence: “She had the skin on the bones.” Michelangelo drew her in her plain dresses she preferred as a widow and never forgot her widow’s veal she bound round her head or wore as a turban and a head-scarf. “Lezzi, vezzi, carezze, or, feste, perle, chi potria ma vederle?” – Jewellery, necklaces, flattery, gold, feasts, and pearls! Who perceives this gewgaw, when she creates things divine?